Boost your playing and be inspired with a monthly harp ensemble. This is for any harp student aged 8-18 who has done at least one year, up to grade 5 standard. We will work by ear as well as by score. Last Sunday of the month, 2.15pm - 3.45pm (set up 2-2.15pm). Parking: park for free on Rymers Lane. You may have a short walk back to the community centre. See http://www.stephwest.co.uk/wordpress/harp-club/ for more information. 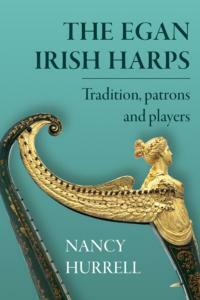 To launch her new book, Nancy Hurrell will give a short lecture: 'The Royal Winged-maiden Harp'. Hurrell uncovers the story behind the museum's exquisite golden harp by John Egan, featured on the cover of her new book, The Egan Irish Harps. The harp's restorer, Michael Parfett, joins the discussion. The book will be available to purchase. Led by internationally renowned harpists Oliver Wass and Joy Smith. Join them for a dynamic and engaging weekend of private lessons, master classes and ensemble playing in the beautiful Low Farm in Suffolk. See www.ibacusharpcourse.com for more information. Workshops for all harp players of school age. From beginners to post-grade 8, there will be something to inspire and challenge everyone. If you are interested in taking part in RNCM Young Harps, please email Bryony Taylor, Music Education Administrator, at bryony.taylor@rncm.ac.uk or call 0161 907 5398. 7.00pm in the Music Hall. Please email harp@gsmd.ac.uk for details.